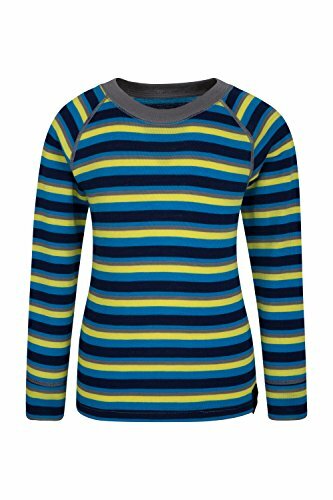 The Merino Kids Stripe Round Neck Top is a fun, colourful base layer, perfect for when it gets colder. In a bold striped pattern, the top is made with merino wool, which is naturally antibacterial and is sure to keep your little ones warm and toasty. Merino Blend - Merino is a very warm, high quality natural fibre. Breathable - Highly breathable fabric lets moisture out, making sure you stay dry on the inside. Quick Wicking - Actively wicks moisture away from the skin, keeping you dry and comfortable. Naturally Antibacterial - Fibres have natural antibacterial properties, keeping your garment fresh and odour free. Lightweight - Compact and easy to carry. No added bulk. Fabric Composition - 70% Merino Wool, 30% Polyester.